And it’s true. Made up of staples like salt, pepper, onions and garlic, it really does cover the bases. It was solid advice, and carried me through the summer Katie-Sue and I worked as camp cooks. Chicken, beef, potatoes, soups, fettucini alfredo… we drew the line at cornbread but it was probably considered. It went in everything. Today my fingers slid down the shelf of neatly labelled spices. I had to find something to add a touch of flavour to the croutons I was making. I started the sniff test. Parsley. Smells like grass but adds nice colour. Basil? Mom’s green beans flashed through my mind. Yum. Oregano… Maybe. This one conjured spaghetti sauce. Ginger? I smelled it on a whim. Bing! A melon-salad memory zipped into my head – of a tastly, light ginger dressing for a summery melon salad. Katie-Sue and I made it once on a gorgous day the summer we cooked at WilderNess. I had forgotten. I’ll have to get that recipe. Saffron. Boom. Janice’s Saffron Wild Rice in Spatsizi – the first time I’d ever tasted it. Rosemary? Stuffing! Yes! I think of homemade fluff from heaven and instant-stuffing-in-a-box that I could eat for days. My brother is appalled at the idea of eating it plain and straight from the box and remembering his look of disgust last time he caught me at it makes me smile in this Manitoban kitchen. Rosemary, Garlic, Parsley, Salt and Pepper – done. Staring at the bread squares triggered one more recipe connection: Our late friend and neighbour Teresa’s Top-Secret Italian I-Can’t-Tell-You-What-Because-It’s-Top-Secret! I’d have to email Mom for my recipe copy. 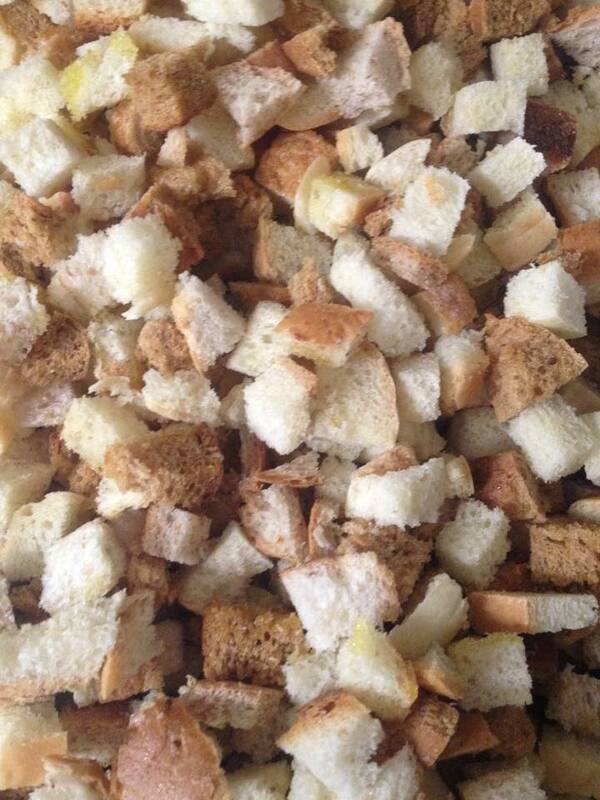 I looked at my croutons fondly, spread out on baking sheets and ready for the oven. There were so many. How satisfying! But amid all these recipe connections and mental notes of which ones to try first my brain latched on to the people behind them. Expanding beyond the spices, I think of people in my life connected to many thoughts and actions throughout my day. 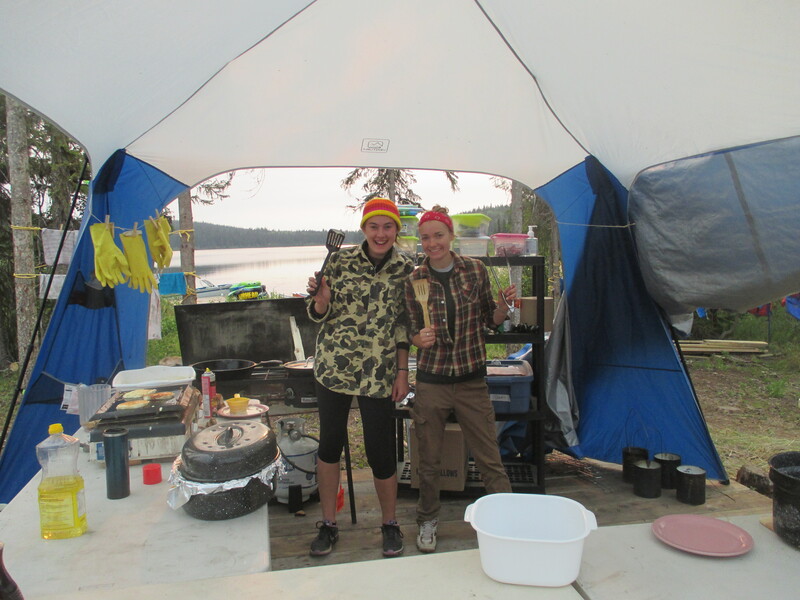 Blending oil and eggs in a jug whisks me back to Fish Lake, with Caryn and the other Anna, cooking under a tarp; Good times. I think of Shawnee when I reuse my bread parchment paper, and scraping dough off the counter transports me to my first job and my boss’s kind face. Trifle-making, I remembered watching Melody’s hands do the exact same thing, what, a week ago? Food is an important part of our culture, and I like it, but even more so I was happy thinking about all the people who flit across my mind in a day, accompanying my thoughts and actions. I’m happy to have you. The advice and wisdom shared extends beyond food preparation and kitchen tips, helpful as it all has been. But truly, what I value more are the memories, experiences, and lives behind each trigger and I’m grateful I have so many who have chosen to share not just your recipes, but your lives. So basically. thanks for the warm fuzzies in my crouton production today guys. Life without you would be as sad as a hunk of cubed bread left to dry up in the bucket. Pretty bland. Thanks for being my amazing support group.